A brand new concept design for a new bike helmet has emerged on Kickstarter, which demonstrates how a bike helmet can do more than just protect your head. Cyclists have always had a love-hate relationship with this necessary safety tool, but now there’s the potential to push beyond post-accident safety towards protecting cyclists as they ride. 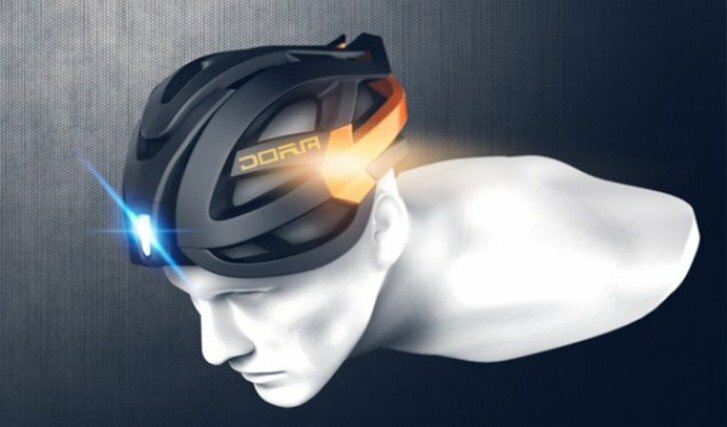 The DORA helmet, pioneered by Balázs Filczer, works with Bluetooth handlebar controls to act in a similar way to the lights on the back of your car. Standardised lighting, like red lights for breaking and indicators are incorporated, instantly notifying traffic of your actions and intentions. As you can see in the pictures, the helmet’s design incorporates indicator lights that can blink to let others know when you’re planning to make a turn.